West Bridgewater, MA, 5/22/17 — Old Colony Hospice has been named a 2017 Hospice Honors Elite recipient by Deyta Analytics, a division of HEALTHCAREfirst, the leading provider of Web-based home health and hospice software, outsourced billing and coding services, and advanced analytics. Hospice Honors is a prestigious program that recognizes hospices providing the highest level of quality as measured from the caregiver’s point of view. Award criteria were based on Hospice CAHPS survey results for an evaluation period of October 2015 through September 2016. Award recipients were identified by evaluating performance on a set of 24 quality indicator measures. Performance scores were aggregated from all completed surveys and were compared on a question by-question basis to a National Performance Score calculated from all partnering hospices contained in the Deyta Analytics’ Hospice CAHPS database. Hospice Honors recipients include those hospices scoring above the Deyta Analytics National Performance Score on 20 of the evaluated questions. Deyta Analytics holds a special recognition, Hospice Honors Elite, to honor hospices scoring above the Deyta Analytics National Performance Score on all 24 of the evaluated questions. 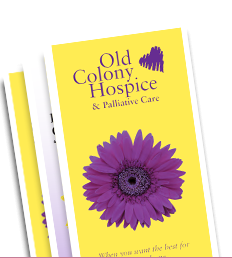 For over 38 years, Old Colony Hospice’s team of registered nurses, social workers, counselors, hospice aides and volunteers has been providing caring, compassionate hospice care to patients and their loved ones. A freestanding, non-profit, Medicare certified, CHAP accredited health care organization, we are proud to serve over 50 cities and towns in Southeastern Massachusetts.